The central purpose of the Keycare Strategic Planning process is to guarantee that the course and direction are well thought out, sound and appropriate, and that the limited resources of the organization are sharply focused in support of that course and direction. Keycare prefers to take the strategic planning process through strategy formulation to implementation. Keycare's strategic planning process covers the entire spectrum of issues – from the view at 50,000 feet (who we are, what we do) to the specific steps necessary for the execution of action plans. Implementation: Developing Action Plan to accomplish the Goals and Objectives; and Key Performance Indicators ("KPI") to measure success. 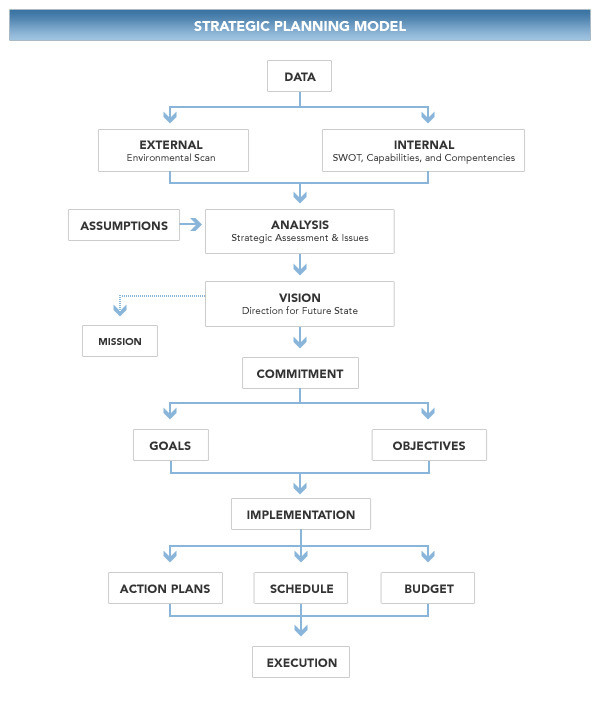 "No one strategic planning model is right for all organizations or circumstances, but experts agree that a business that develops and executes a strategic plan gains significantly from the experience. A business that starts with a working strategic model and develops a tangible plan will be more successful than a business with no plan at all." "Tom Keogh and Keycare has the 'formula' for getting things done to assist organizations through complex projects, such as the one they did for us as the Project Manager with the set-up and implementation of the First Nations police service, the Lakeshore Regional Police Service. This was evident through their combination of related experience and skills, not to mention managing and working well with the many stakeholders involved. Excellent job of keeping everyone involved, informed and on track – your role and contribution was invaluable."